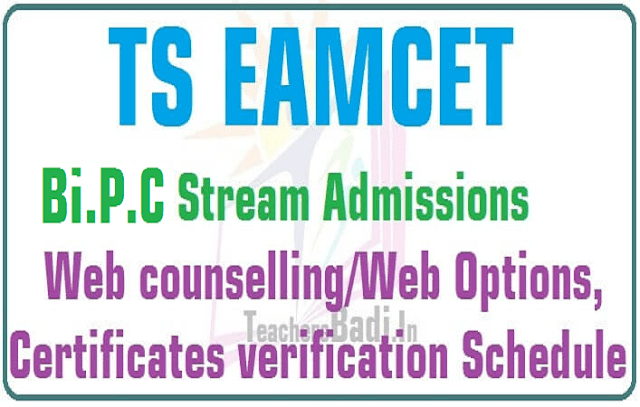 TS EAMCET 2019 BiPC Stream Admissions, Web Counseling dates, Certificate Verification Schedule, Web Options Dates, Web Options Entry Schedule. Certificates Verification and Option Exercise for Web based counselling, TS EAMCET 2019 BiPC Stream Admissions Counselling: The Qualified Candidates of TSEAMCET-2019(BiPC STREAM) who have not attended for Certificate Verification earlier shall get their Certificates verified from designated Help Line Centres The candidates who have participated in Phase-I Counseling can also exercise options using their old password, Login ID, for the leftover seats now available and consequential vacancies that may arise in the process of allotment as per the schedule given below, and it is advised to exercise options for interested Bio Technology, B-Pharmacy and Pharmacy (including Pharm D) Colleges assuming that vacancies are available in the course of their choice. LAST ++ Means: Minority Candidates including Not Qualified/Not Appeared in TSEAMCET–2019 (Bi.P.C) who have already applied to Convenor based on Intermediate or its equivalent marks. LAST ++ Means: Minority Candidates including Not Qualified/Not Appeared in TSEAMCET III-2019 who have already applied to Convenor based on Intermediate or its equivalent marks. 2. Who have not secured seats so far but got their certificates verified. 3. Who have not exercised the options so far but got their certificates verified. 4. Who have secured a seat, reported and aspiring for a better option. 5. Who have reported/Not reported but cancelled their Phase-I allotment. 6. And any other eligible candidates. See above mentioed the list of documents..
1. PH-Certificate issued by District Medical Board--- Candidates with 40% and above disability are only eligible. 2. CAP- Certificate issued by Zilla Sainik Welfare Officer, Identity card, and Discharge book (In case of Ex-Service men) and Service Certificate (in case of in Service Men) issued by Competent Authority for verification. Candidates whose parents are domiciled in the State of Telangana based on the Permanent Address/Home Town declared by them while joining the service and as recorded in their Service Register are alone eligible to be considered under “CAP” Category. 3. NCC & Sports- To produce Original Certificates issued by competent authorities. Minorities: SSC TC containing Minority Status or Certificate from the Head Master. Anglo-Indian: A Certificate issued by Tahsildar of their place of Residence. 2 . The candidates who secured 45% (For OC) and 40% (SC/ST/BC) in group subjects of Intermediate or its equivalent examination are only eligible for admission as prescribed by AICTE/Government. 1. Processing Fee: Rs.1000/- (OC/BC), Rs.500/-(SC/ST) at the Time of Certificate Verification. 2. Tuition Fee particulars and seats available under Convenor Quota College wise will be made available on the website https://tseamcetb.nic.in well before the commencement of Option Entry. The fee reimbursement for eligible candidates is subject to the guidelines issued by the Government from time to time.